I’m feeling quite relieved that I’m on top of my Christmas preparations this year. I wanted to spread the cost by starting early and make sure I had time and energy for the 12 days of December when the kindness elves come to stay. So most presents have been purchased and stashed including the bits and pieces for the boys stockings from Santa. I’ve yet to make Luca a Christmas stocking (I’m not that organised!) 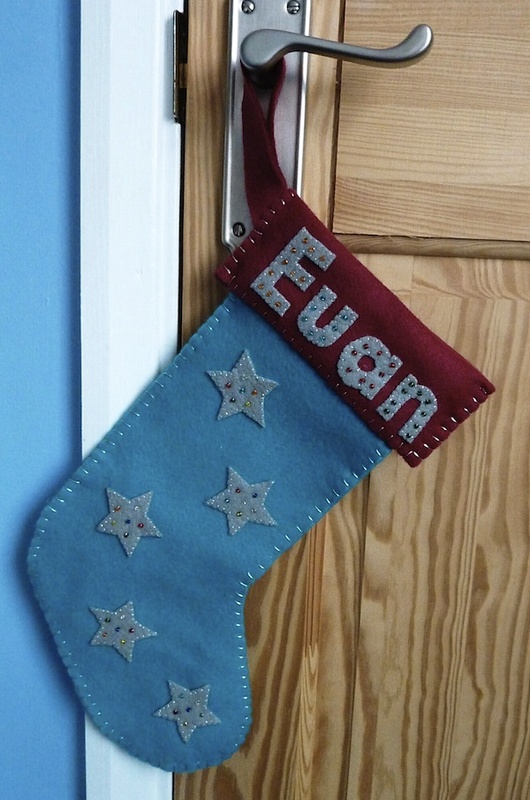 and thankfully I wrote a blog post about how I made Euan’s Christmas stocking a few years ago so it should be simple enough to fashion a second one. With the extra time on my hands I’ve been able to have a rummage around the OXO elves Christmas sack to bring you a new stocking fillers gift guide for 2017. Some of the OXO items recommended in previous years are still available and some of those items continue to be our favourite kitchen gadgets (see links at the end of this post for a little reminder of further OXO gadgets). The gifts we’ve trialled for you this year are all under £15 and our absolute favourite is less than a tenner. I’ve been meaning to add a pair of tongs to my utensils pot since attending a ”low carb, high veg” cookery class at the Foodworks Cookery School while pregnant with Luca. 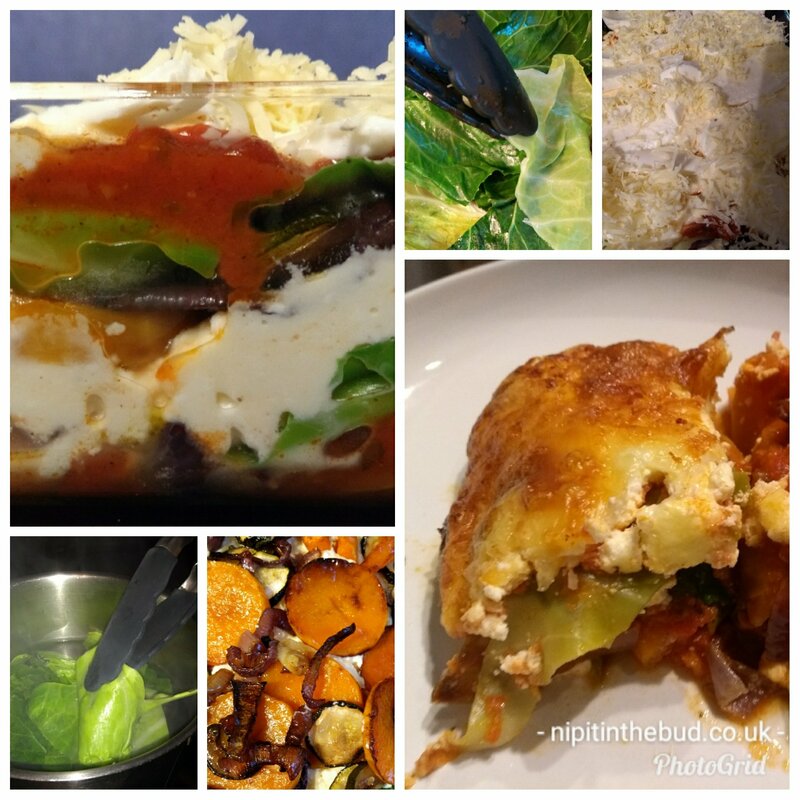 We made a vegetarian lasagne with cooked cabbage leaves instead of pasta sheets and the tongs saved scolded finger tips. I recreated the recipe to try out our new tongs and found them easy to use and they lock for convenient storage. Luca enjoyed playing with them too of course so what’s not to love about a kitchen utensil that doubles up as a toy! This is my number 1 kitchen favourite this year. It’s been designed to measure small pourable amounts accurately and you can see the measurement markings, in ml and tbsp, while looking straight down into it. On the OXO website it’s advertised as a cocktail measure but we’ve found all sorts of other uses for it like making salad dressings or simply to help monitor the nutrient value of the fluids we use. I use an app called MyFitnessPal, a free diet and exercise tracker, to become more aware of the nutrient value of the food I eat. I’ve been reducing carbs and increasing fats and combined with walking more I’ve seen a gradual shedding of the last of my baby weight (google ‘Grain Brain’ or ‘Keto diet’ if interested in the science behind that). It’s great using the steel jigger to measure small amounts of fluids instead of guessing or counting in teaspoons. 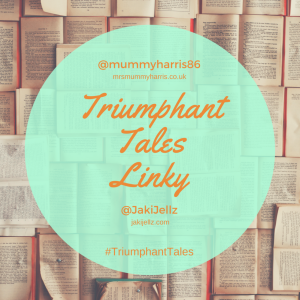 For example, I’d been estimating a 30ml measure of milk in my tea when in fact I take double that, a difference of 100+ calories across my 3-4 cups a day (that’s equivalent to a couple of biscuits added on or a 30 minute walk to take it off). 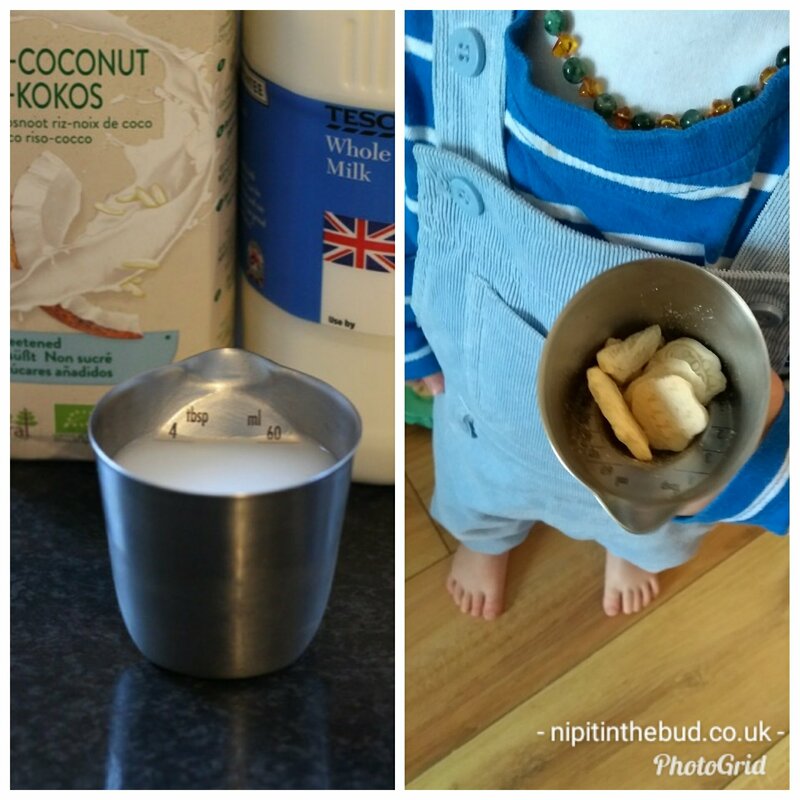 It’s a really handy tool to have in the cutlery drawer and it even doubles up as the perfect toddler size clutchable snack pot. My boys love ice cream, especially G who’s been instructed to eat it in secret so the little ones don’t develop his insatiable sweet tooth! 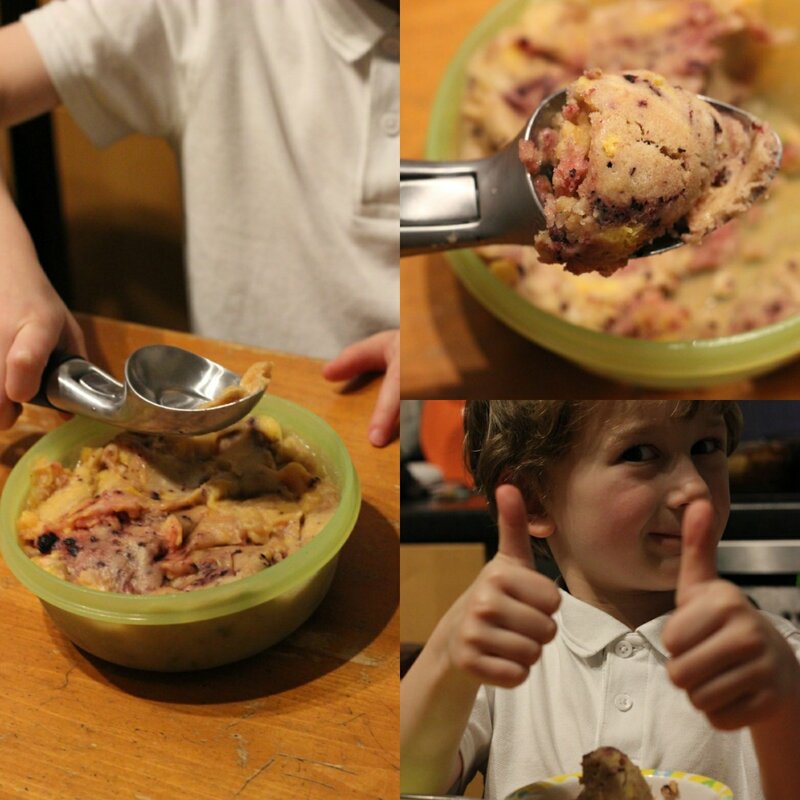 Thankfully E and L love the novelty of anything yummy frozen and served nicely and happily tuck into whizzed up frozen fruit. Zero added sugar, zero fuss. The only effort comes in the having to remember to put the bananas in the freezer the night before. Our home made fruit ice cream provides the perfect challenge for this tough aluminium beak shaped scoop as being dairy free it’s harder and more icy. The curved side edges and pointed end made it easy and it has a non stick coating for easy release. By the time the kettle had boiled to dip the scoop into E had already served up his own helping, evidence enough that this scoop can handle anything. 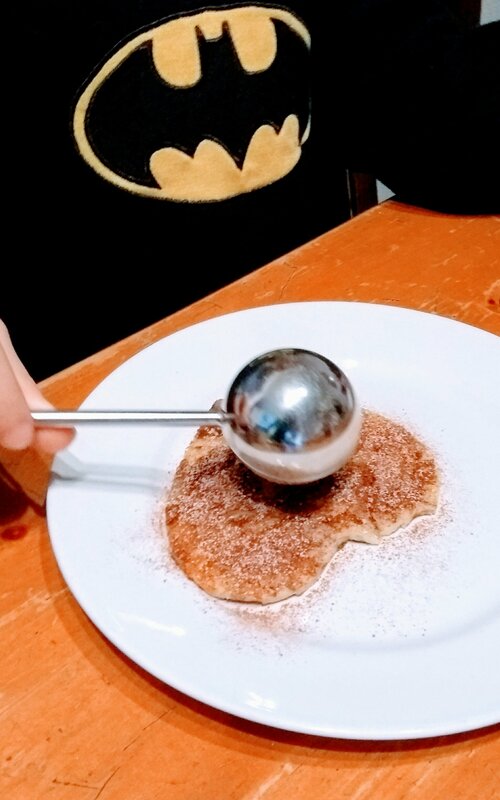 He liked the novelty of the lever that helps to flick the contents out but to be honest it wasn’t necessary as it slipped off into the bowl easily enough without using it. 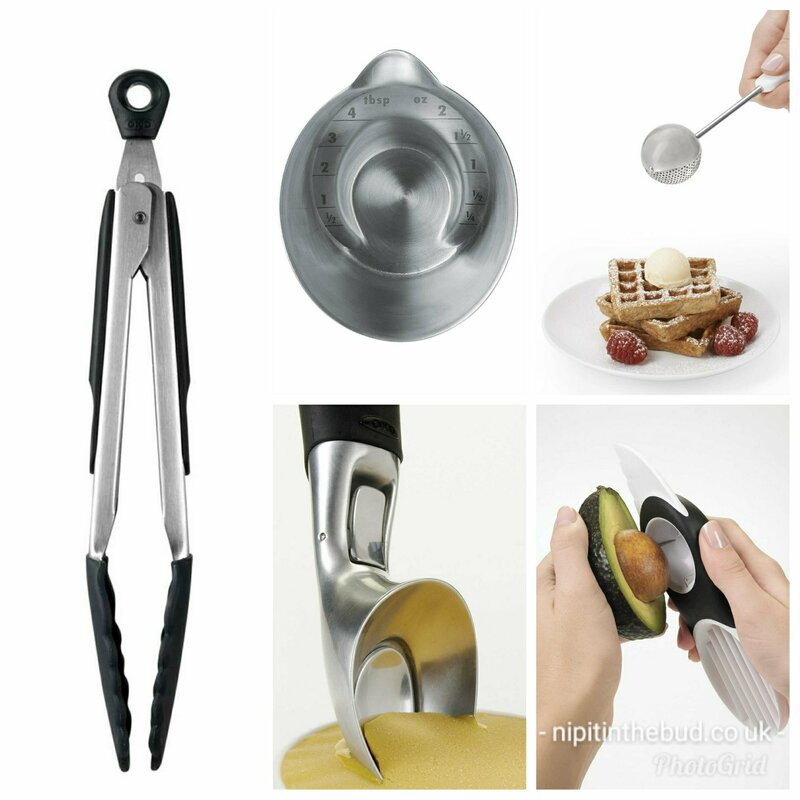 ”The avocado slider splits, pits, slices and scoops for safe and mess free preparation”. I’ve seen these before and wondered what all the fuss was about! I do get quite messy cutting and peeling my avocados but I figured a gadget wasn’t worth the bother. Turns out I was wrong and it brilliantly removes the stone without any damage or loss of avocado. OXO tried 700 different shaped avocados to perfect their design afterall. All of the avocados I’ve used it on have been a bit too brown and mushy for a nice picture so here’s a video clip of the avocado slicer in action. It really is as simple as it looks. Gift 5 – Bakers dusting wand, £10. We reviewed the tea ball a few years ago and I find it’s always disappearing from the drawer only to be found in the boys room with jewels or lego treasures in it. OXO have come up with another use for it – as a dusting wand to neatly sprinkle flour, powdered sugar and spices onto drinks and food. The quick open and close twist of the half solid half perforated globe design, prevents clumps, dumps and powdery messes. It’s been sized to fit most flour containers for storage, a tactic I would have had to resort to if we only had one! Our favourite use of it is for sprinkling cinnamon on hot drinks and cocoa powder or cinnamon sugar on our pancakes. I’ve been using gluten free flour lately for baking and these pancakes made with chick pea flour and mashed bananas were topped off beautifully with a little dusting of cocoa. So there you have it, a few ideas to get you started on your Christmas shopping if you’ve not made it to the shops yet. Previous years OXO stocking filler suggestions are shown below and reviewed here and here. Disclosure: I selected the OXO items in this guide to try. I was not required to write a positive review and all opinions expressed are my own. There’s some great bits and bobs there – I do love a good kitchen gadget and am a big fan of Oxo for kitchenware.